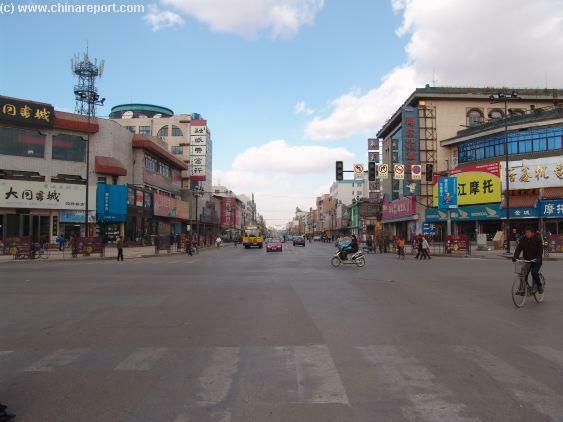 View of Datong's Central City Intersection, the pivital point of the Old Walled City, although you wouldn't have guessed it when standing there. Left to Drum Tower & straight on to HuaYan Monastery. 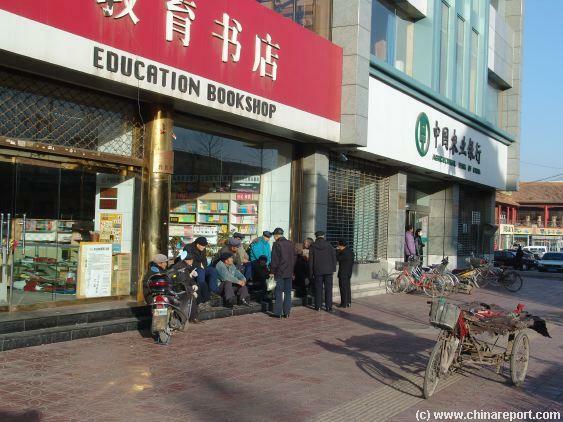 Local Men enjoying the afternoon sun and eachothers company on the stairs of Xinhua Bookstore, a useful recognition point in view of the Nine Dragon Screen Grounds. View of South Street upnorth towards central intersection, Mouse over - view of the Drum Tower from the North. Walk down South street while navigating on the Sun and the Drum Tower South of Central City intersection. Past the wooden drum-tower continue south and see the former City South Gate (and Walls) appear in the distance. The Small Park seperating this small road from the housing and the City Wall. An overview of the Shan Hua Monastery grounds hidden behind the South City semi-modern fronts. Another view of the earthen City Walls while moving West. This is a Dead End Alley. Gate to the small and very modest Nan Jie communist model housing "Institute" seperating Shan Hua Monastery from the City Walls. The Nan Jie Housing Management Institute, a remanant from revolutionary days, across from Shan Hua Monastery 's Main South Gate. reinforcements. Looking North one has a magnificent view of the Shan Hua Monastery with its ancient and paintless Halls. Down below are the old houses, now mostly abondonned except for few hangers on who stay , for now. Try and find the Non descript Central Intersection, which is mainly recognizable by the Branch of the Education Bookshop on the corner of DaDong (The East) Street. To be sure of your location, when standing at the Central Intersection one should be in view of the Xinhua Bookshop and/or the Jiu Long Bi - Nine Dragon Screen Site at DaDong Street. To the South, one city-block down the 3 storied wooden Drum Tower is visible. Head towards the Drum Tower for a walk-around. The Drum Tower is not open to the Public (yet), but around it stand some of the few remaining true hutong dwellings of the Old City. When you are done admiring the architecture of the Tower and possible remaining historic housing, head further south and keep going to find the South Gate and Walls. 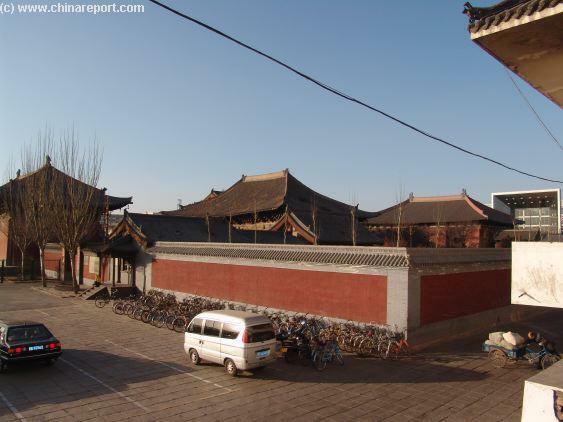 The distance from the Drum Tower to the South Gate and the entrance road to the Shan Hua Monastery is at least two more blocks, but they are impossible to miss, eventhough most buildings at Datong's Main Streets look remarkably similar. After a stiff walk the Walls will appear in sight West of you on your right-hand. 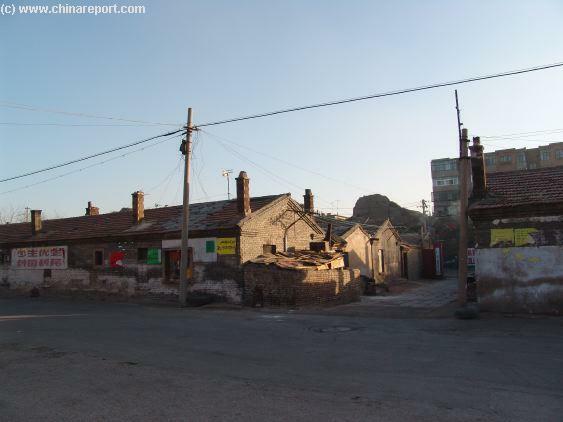 This is also the location where road leading to the Shan Hua Monastery can be found. Find your way along the Road past a small park with few meager plants to explore the space South and in front of Shan Hua Monastery. Several Walls and houses of the "Nan Jie Housing Management Institute", a relic from the revolutionary era, block the way South but the City Wall remains can already be viewed and observed well from here. To make the climb to the top, pass through iron gate which is usually open for local traffic to the houses. 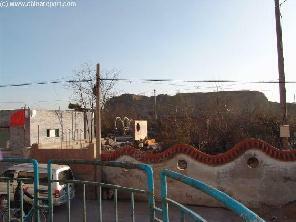 Since many of the houses have been left abandoned, it easy to get to the base of the wall and start your climb. When doing so, please be aware of possible stray dogs. Rabies is a problem in the Chinese country-side, some caution with animals, especially dogs, is well advised. 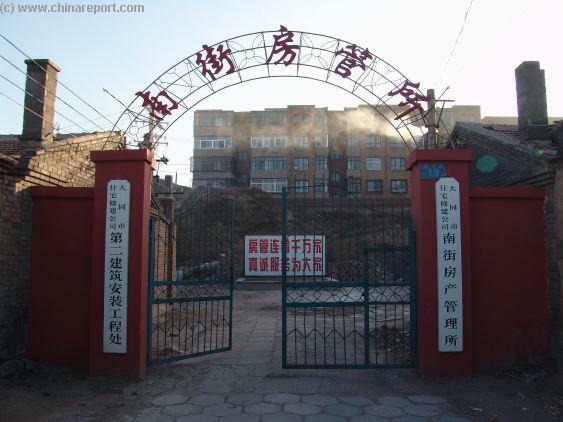 Although once a model communist housing institute, this is not an upscale neighborhood with properly vaccinated pets. 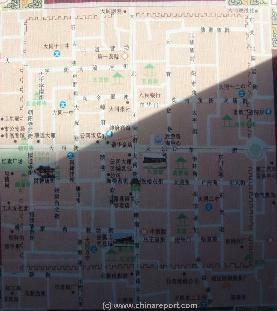 Local Map of Datong's Old City Section with location of main streets and landmarks. Full view of the former City South Gate (and Walls) in the distance. - Click to Enlarge ! the Main Defensive Walls of the City. The main road of the smaller Old City section is CaoChangCheng Jie, leading from the South- to the North-Gate. The Main Railway Station, part of the New City is just a block or so further to the North-East. 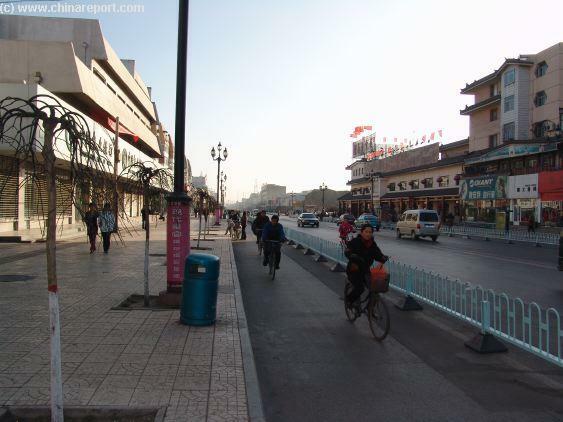 The least interesting direction to go to from the Central Intersection is due West along DaXi Jie'. 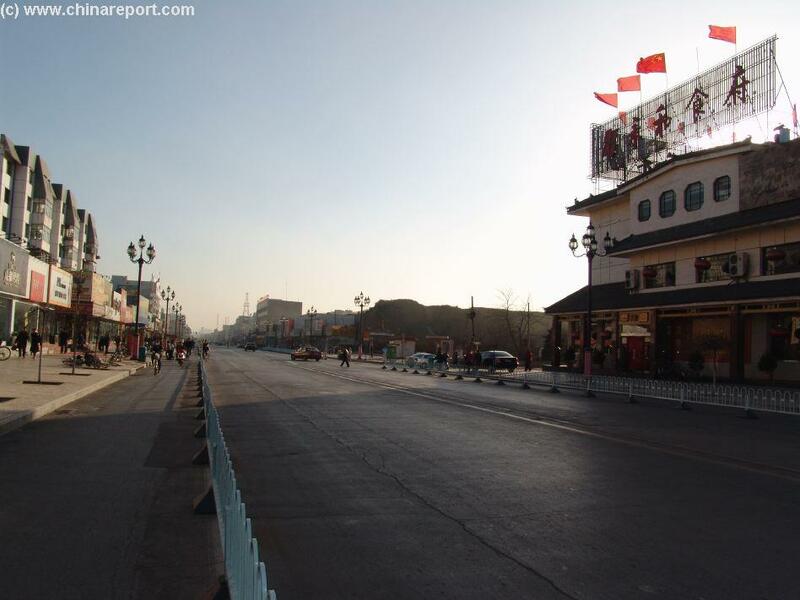 DaXi Jie leads past the Yungang Hotel and XiaSiPo Xiang (location of the HuaYuan Monasteries Entrances) to the Former West Gate which does no longer exist. Pass through un-noticed into the New City via Red Flag Square. No City Walls are accessible here. 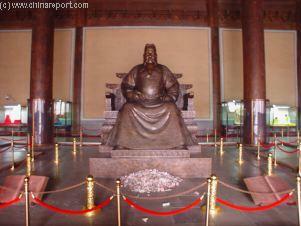 The Giant Statue of Zhu Di Emperor Yongle, 3rd Emperor of the Ming Dynasty at his Mausoleum, Chang Ling, outside Beijing. The Fourth Son of Zhu YuanZhang (TaiZu), the First Emperor of the Ming, Zhu was named "Prince of Yan" and made commander of the Northern Defenses which included the Great Wall Pass at YanMen Guan and the City of Datong. Zhu Di, Emperor Yongle, died in 1424 AD during one of his Military expeditions in the Northern Region. directions as the City is surrounded by square City Walls. Just head East, West, North Or South along one of the four main streets and you will find the remains of the 12Th Century Walls, no doubt. 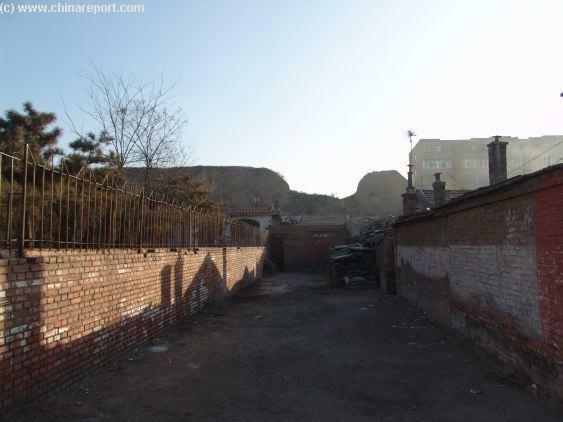 What was not mentioned is that there is another peculiar section of defensive Walls, slightly smaller in size and cirumference, just North of the original Walled City of Datong. Find this section by making your way due North from the Central Intersection, along DaBei Jie'. 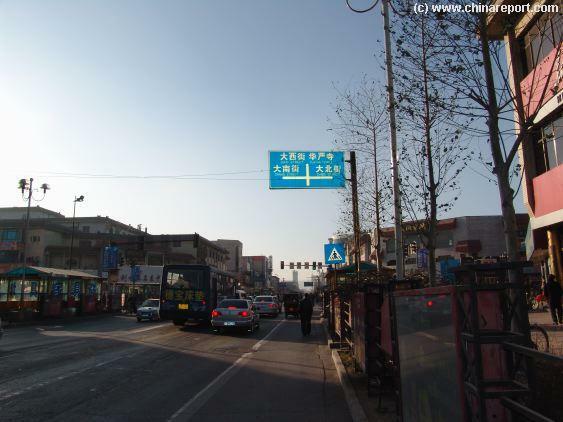 After locating the Former North Gate of the City, cross the intersection with Yangtong Lu (Yantong Xi Lu and Dong Lu lead away to West & East respectively) and continue on some 100 meters until reaching the smaller City Wall and a new Section of Wall Protected City.